The following day’s brewery visit took me in a completely different direction, to Ozawa Shuzo in scenic Sawai, nestled among verdant mountains about two hours west of the city, but still in Tokyo prefecture. This time, a pleasant five minute walk through the picturesque village led me to my destination, the kura that brews one of my favorite sake, Sawanoi Kiokejikomi Iroha Kimoto Junmai. My guides Kubo-san and his assistant were gracious and informative, making sure that I saw the cedar tank (kioke) used in making the aforementioned brew, the underground springs that are their two water sources, and a wall of koshu (aged sake) vintages dating back 20 years. Another highlight of the visit was a perfect lunch at their fabled tofu restaurant perched serenely just above the rapids of the Tama River. 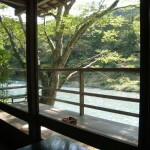 As my server presented each in a series of delectable tofu dishes, I sipped from the flight of four Sawanoi sake that I had pre-selected while gazing at the natural beauty of the tableau spread out before my windowside table. Even as rain began to fall, it only enhanced what couldn’t have been a more peaceful and relaxing experience! Accompanied by our friend Melinda, I set out early the morning following the SSI awards event for Huchuhomare Shuzo in Ishioka, a small town in Sonoma-like Ibaraki-ken, about an hour and a half north by train from Shinjuku station in Tokyo. 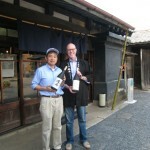 On our arrival at Ishioka station, we were greeted warmly by the smiling shacho-san (brewery President) Takaaki Yamauchi. As he drove us to his family-owned brewery, we discussed the local effects of the typhoon which had made landfall in eastern Japan the day before, destroying several older buildings nearby. Fortunately, no harm had come to any of the inhabitants! (Aside from high winds which temporarily shut down rail service, the much-anticipated typhoon had been a non-event in Tokyo). Following a welcome of tea and sweets in the ancient reception room, Yamauchi-san led us on an intriguing tour of the kura. We then tasted the full line of Wataribune nihonshu as he described the history of the brewery and how he had come to use the unique Wataribune strain of sakamai (sake rice varietal) to make his sake. 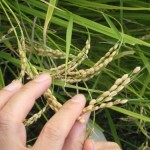 It seems that a former high-ranking Ministry of Agriculture official who had retired to the locale, about twenty years ago suggested that Huchuhomare consider resurrecting the long-ago used pure strain. Only problem was that all they could find was about 15 grams of seeds in the seed bank. Not a lot to start a rice field with! Nevertheless, they planted it, collected the seeds each year and eventually cultivated a sufficient supply for sake brewing. 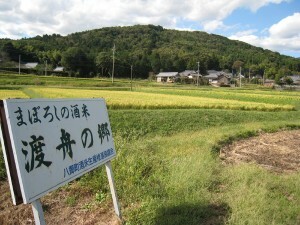 The story came to life quickly as our next stop was that very rice field itself which surrounds our lunch destination, the homemade tofu and soba restaurant owned and operated by, you guessed it, the gentleman who brought Wataribune to Yamauchi-san! To learn more about the wonder of Wataribune, read this. 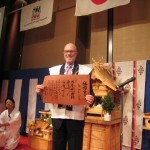 Earlier this month, I traveled to Tokyo to receive The Sake Service Institute’s (SSI) Honorary Master Sake Sommelier Award (Kikizake-shi) on behalf of SAKAYA. 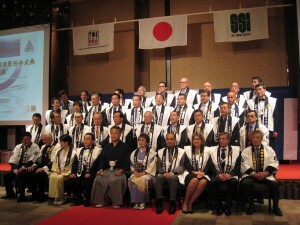 Since it was the 10th Anniversary of these awards, there were a number of luminaries from the worlds of sake, journalism, and Japanese hospitality in attendance at the three-hour event which featured a Shinto ceremony, awards presentation, and dinner. 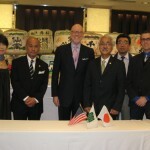 As one of three America-based honorees along with True Sake‘s Beau Timken and T.I.C Restaurant Group‘s Bon Yagi (owner of Sakagura, Decibel, Robataya, and a number of other Japanese restaurants in NYC), I was thrilled that our efforts to promote enthusiasm for sake and its linkage to Japanese culture were recognized, and honored to have been included among such distinguished (and far more accomplished) company. Accompanied by Hiroko’s dear friend Hitomi, who met me at my hotel dressed in a beautiful pink kimono, I found the event to be a curious mix of glitz and traditional ritual. At one moment we’d be bathed in swirling lights from a mirror ball with blasting disco music, then a few minutes later, silence would be broken by mournful chant from a Shinto priest. It was truly East meets West. 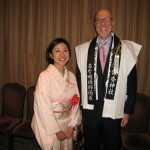 We shuttled back and forth between a reception room where we met and conversed with the other honorees, SSI dignitaries, and their friends and family to photo sessions, and the ballroom where the Shinto ceremony and awards dinner took place. During the dinner, we were called to the stage to accept our awards, traditional scrolls bearing our official kikizakeshi plus a medal of honor which would put a military commendation to shame, while those in attendance ate or watched (or both). What I found interesting was that although it was a sake event, the beverage was but a bit player in the grand scheme of things. It was available in the reception room during our down time between shuttling and a small glass was at each of our seats during the ceremony. I purposely didn’t drink it as I anticipated a “kanpai” at the conclusion of the proceedings which never came. For dinner, there were four sake servings of about 2 oz. but no refills offered. Odd, I thought for an event dedicated to promoting service of the brew! What there was in abundance were appeals for money. 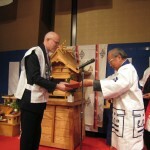 Each of the honorees had been responsible for a “donation” to the Shinto shrine from which the priest had come to perform the ceremony. There were also envelopes and forms given to each person soliciting donations for the SSI foundation. Finally, after the awards were given and as dinner segued into dessert, there was an auction of sake, shochu, and other donated items to raise money for the same(?) foundation. I couldn’t help but get the feeling that fund-raising, may in fact, have been the point of the event. The balance of the trip was devoted to: visiting sake breweries Huchuhomare Shuzo and Ozawa Shuzo, the makers of Wataribune and Sawanoi respectively, a sake yeast focused tutorial tasting at Japan Prestige Sake‘s Okanaga Club with sake master Dr. Koichiro Mori, exploring the Tokyo food and drink scene with friends Hitomi and Hanayo Kishi, Melinda Joe, J.P. Mudry, Ted O’Neill, Etsuko Nakamura, and a day of tasting sake from Shimane prefecture, sake shopping, and izakaya drinking with friend and mentor John Gauntner. 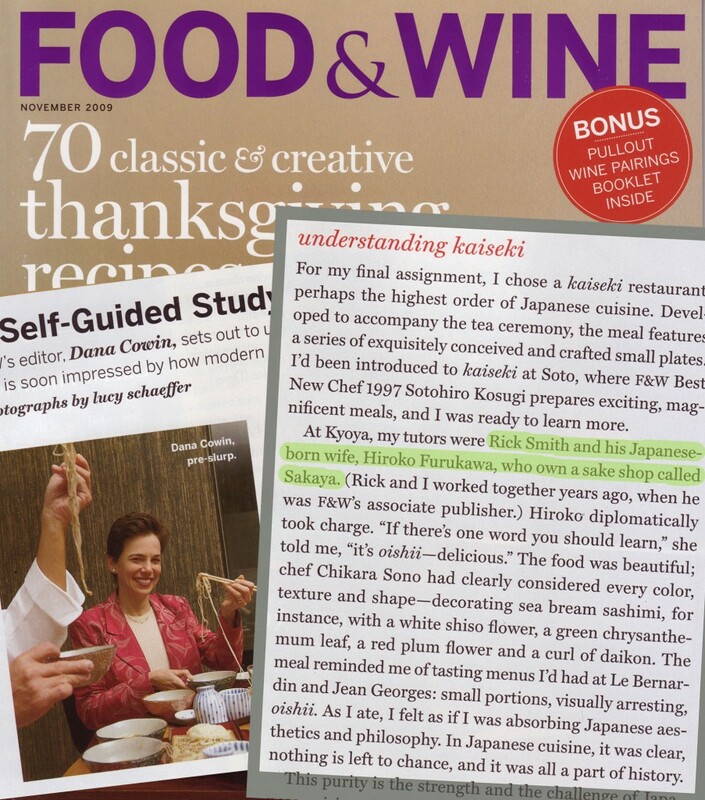 We’re delighted to be mentioned in the November 2009 issue of Food & Wine magazine. Early last Spring when Dana Cowin, the editor of F&W, asked us to be her Japanese food guides, we were happy to introduce her to our favorite Japanese restaurant, Kyoya in the East Village. In traditional Japanese style, we ordered a variety of dishes from vegetables to fish to meat. With Hiroko acting as interpreter, Chef Chikara Sono graciously took the time to answer Dana’s questions, as she carefully inspected the ingredients in each dish, even making notes on their colors as displayed on the plate. Dana and Rick have known each other since they both joined Food & Wine in 1994 (she as the Executive Editor and he as Associate Publisher). Not only was it fun to assist in the development of the story, it was also a pleasure to sit down and share some incredible food with an old friend. 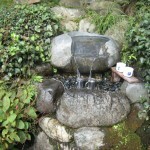 Interested in visiting sake breweries? If you are, we have exciting news…. Our friends Etsuko Nakamura and John Gauntner (author of The Sake Handbook) have put together the sake-lover’s dream vacation! 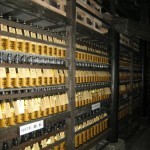 Now, anyone can access the inner workings of the sake world. 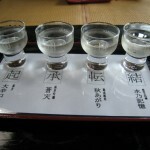 Visit Japan, start off with a bit of formal sake education by sake guru John Gauntner, then you’re off to visit several sake breweries to see how sake is made while under the care of an experienced sake-savvy interpreter. 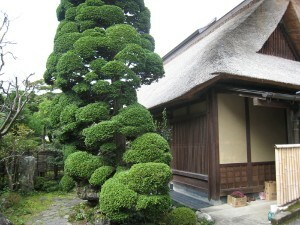 Some stays in ryokans (Japanese inn) and sake-focused dinners at izakaya (sake pubs) round out the experience. Visit sake breweries including those in the historic sake town of Fushimi (in Kyoto), one of the major brewing towns in Japan as well as Japanese gardens and historic Nijo Castle, built by Tokugawa Ieyasu, the first Edo period shogun. In addition to visiting breweries, this tour also includes a visit to the Izumo Grand Shrine, one of Japan’s most ancient and important shrines, plus parks and art museums. 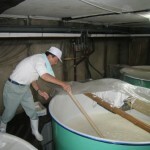 For more information, pricing and reservations please visit Sake Brewery Tour. Participation is extremely limited this season for the two tours that are scheduled. October is an exciting month for sake enthusiasts. Nihonshu no Hi (Sake Day) on the 1st is when Japanese celebrate with Hiyaoroshi, the first release of once-pasteurized sake bottled in the spring. We’ll be offering two tastings for you to try it on its first availability in this country later in the month. In the meantime, we’ll be reprising the popular Ume no Yado Yuzu-shu and Aragoshi Umeshu and debuting the new-to-our-shores Ninki ichi Junmai Ginjo on consecutive weeks. Please join us for any and all as we celebrate the fall season at SAKAYA! You are currently browsing the Sakaya NYC Blog weblog archives for October, 2009.